As you can see by our web site, I love our animals and especially Persian cats. I believe that a vitamin supplement will help any cat or dog. 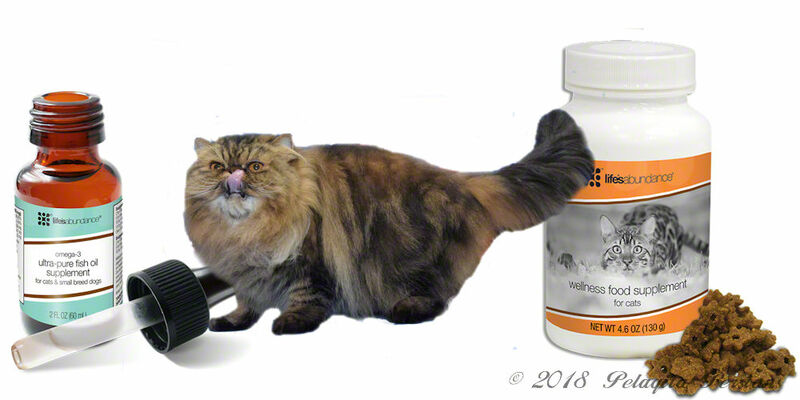 I wanted to share this information with not only the Persian cat community, but all the animal lovers out there, about what I believe are the ultimate cat vitamin and mineral supplement. As responsible Persian cat breeders and owners, it is very important to me that I keep our cats and kittens healthy not just for themselves, but for our kitten buyers as well. Since we only breed a few times a year, our "girls" have plenty of time to build themselves back up and we feel that giving our cats a daily supplement is a definite source of vitamins and nutrients for them. Like humans, pets also require vitamin and mineral supplements. Like us, no diet (no matter how good) can provide all of the essential vitamins and minerals or they would have to eat a massive amount of the food. Humans take vitamin supplements and so should our pets. Isn't that just common sense? I do not make these supplements or sell it. My goal is to let people know about Life's Abundance Daily Nutritional Supplement since it has made such a big difference for me with our own cats and dogs. We believe that these are the most incredible supplements I have ever seen and used (and believe me - we have tried quite a few of them - and most were much more expensive!). I believe that nothing else comes close to the results I have seen in our cats and dogs. A premium food can go a long way towards optimal health and wellness. But if your cat has additional needs, they should be addressed. Stressors such as environment, lack of exercise, previous injuries and age can intensify health issues, putting your pet kid at-risk for future troubles. Making the most of nature's bounty, Life's Abundance Wellness Food Supplement utilizes micronutrients that are naturalally balanced. Every ingredient is carefully selected for the vital role it plays in the preservation of feline health. Regular supplementation of long-chain omega-3 fatty acids (EPA and DHA) from fish oil can help support your companion animal's healthy skin, coat, heart, brain eyes and joints. However, numerous supplements on the shelves today do not contain the optimal concentration of fish oil. In addition, many of these supplements are not tested by an independent laboratory to ensure purity and safety. 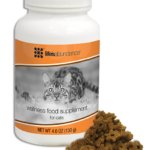 Life's Abundance fish oils contain at least 30% EPA and DHA, an ideal concentration for the overall health of your dog or cat. The oil is in a triglyceride form, which is highly bioavailable and without added flavors so it has a natural taste that dogs and cats love. Sealogix fish oil offers outstanding value. In its unpurified form, fish oil contains many environmental contaminants, some of which can be harmful to your pet's health. To purify the oil takes many steps, each one adding to the cost of manufacturing. 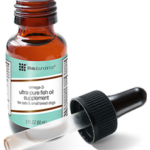 It is important to buy your fish oil from a company that not only says it purifies the oil, but one that is willing to share the test results from every batch made. It's the surest way to know what you're feeding is perfectly safe. Sealogix fish oils for pets are made in a human pharmaceutical facility … the same place as Life's Abundance Sealogix for people. They are highly concentrated and ultra-pure. Like their Sealogix for people, each bottle receives a nitrogen flush to remove oxygen from the bottle before it is sealed for ultra freshness. Plus, Sealogix fish oils meet or exceed the highest standards in the industry for quality assurance. In fact, each batch of Sealogix for pets is tested by an independent third-party organization (IFOS) and the results are posted right here so you can see the quality, concentration and purity that Sealogix supplements offer. Life's Abundance contributes a portion of their proceeds to the Dr. Jane Foundation for Animals. The Dr. Jane Foundation is a non-profit organization absolutely committed to supporting a variety of animal rescue groups, all of which are dedicated to helping to rescue neglected and unwanted animals.